Everything in its place. Each precious object is closed in its box. The jewels in the jewel case, the books on the shelves, the dresses in the cabinet and... the embroideries and the embroidery accessories all in the embroidery cases! There are a lot of them and of different types. Last arrival in Casa Cenina, here is Home Forever by DMC. It's more than a box. 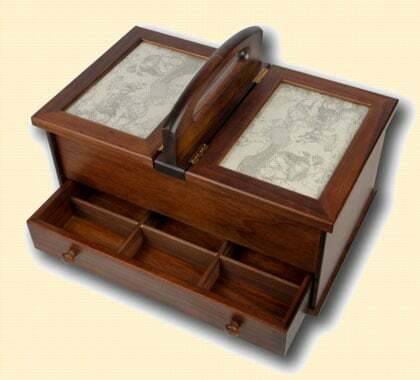 It is just a little piece of furniture made of wood, with one chest and two covers which are ready to stitch. Less precious but very useful (especially when moving and travelling) the Petit Craft Organiser by Yazzii with six sections closed by zips and all with a transparent cover so that you can check what objects are inside the basket. More roomy are instead the Carry All Organiser always by Yazzii with 20 sections. For more eccentric and fashionable people we suggest to you the Zebra Case L to be always under the spotlight! By contrast, if you are fond of DMC and of the Gold System with the little bows, this Mouliné Gold Little Case is perfect for you. And 'the package arrived this morning, and this case accessory ... made me really happy! I knew to buy a quality product because the DMC has never let me down, but despite this has surprised me positively the same: much more beautiful than I imagined. I thank the DMC to design products so useful and well done, and thank Casa Cenina who always knows how to find the best things for us !!!! And 'the best I could to have to guard in perfect order all my things to embroider! Very satisfied (I'm over the moon!). Cinzia. Also I have it in blue version, purchased a few 'years ago. It 's really convenient for storing everything and carry it around. Well finished and robust. The council! I bought about 4 years ago. It 'still like new, excellent quality. It follows me everywhere, there is everything you need. When I stop to embroider, I put everything in and I have no problems to seek needed. The highly recommend. I just received, are stracontenta! essential to keep everything in order and not lose more 'nothing ... Highly recommended !!!! I saw it from a friend, really very beautiful, in fact, I think that we acquire in many. Good buy: capacious and practical, it's all in order. I bought it and I do not separate myself more! Good buy and everything you need is in super order. Excellent solution to bring together all of our "tools." Capacious, but not bulky. I made a good buy. I like very much! Roomy but not bulky and you need is always in order.